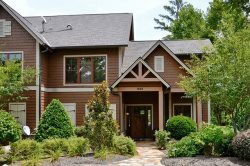 From the patio of this Marina Cottage, take in the scenic views of pristine Lake Keowee, the crackle of a quaint outdoor fireplace, and enjoy being merely a minute's walk from both The Cliffs at Keowee Vineyards Marina and our 10,000-square-foot Keowee Vineyards Wellness Center. There is a maximum of two vehicle passes per reservation unless special arrangements are made in advance. Additional parking is available at the Keowee Vineyards Wellness Center. The Cliffs at Keowee Vineyards is located on Lake Keowee. Home to an 18-hole Tom Fazio golf course nominated by Golf Digest for "Best New Private Course in the Nation," The Cliffs at Keowee Vineyards provides homes and homesites with stunning mountain-lake views in a four-season paradise.